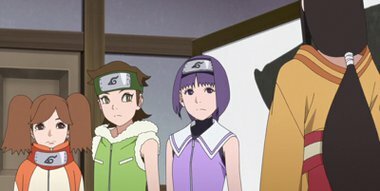 [Filler] Boruto’s aunt, Hyuga Hanabi, is in charge of Team 15, consisting of the three girls Sumire, Wasabi, and Namida. Team 15 has been given the mission to “capture all the animals that have escaped the nature park, after someone had opened the cages”. Although the three are chosen for the mission, Wasabi and Namida begin arguing.